As part of my recent fit of Italian menu fantasies, I craved a white bean soup. I didn't have a perfect recipe for one, though there is apparently a FABULOUS one in Vegan with a Vengeance that I will need to check out, which includes two complete heads of oven-roasted garlic. (Added bonus from reading about that soup at Vegan.Chicks.Rock (veganchicksrock.blogspot.com): the link to the distressing entry on jaeger bomb cupcakes (!?!?).) I am certain that soup rules. I was impatient, and did not want to wait to roast two heads of garlic. So here is my own, ultra-simple version of white bean soup. VERY simple. You can really taste the beans. Which is a good thing. -lots and lots of fresh water. Carefully pick over the beans, eliminating the gravel and any "bad" beans that the machines failed to notice, and put them in a pot with about 5 cups of hot water. Bring to a boil, and simmer partly covered for about 45 minutes, checking the water level periodically to be sure the beans remain submerged as they expand during cooking. You can keep a kettle of hot water going to top them off. At the 45 minute mark, add the garlic and oregano, and stir well. Return to a simmer. Check the water level every 15 minutes or so, keeping the beans submerged. At the hour and 15 minutes mark, start checking the beans for tenderness: if you want a partially blended soup with SOME whole beans, you will want to be able to smash them easily with a wooden spoon, but still allow them to hold their shape. It takes about 1.5 hours of simmering for navy beans to be soft enough for my tastes, but firm enough to retain their structural integrity. When you are happy with the tenderness of the beans, puree half or more of the soup with a hand or beverage blender. Return to the pot and stir well. The pureed beans will make the soup significantly thicker: add water, if necessary, to achieve the thickness you want. Serve with fresh bread and herb spreads. Celery is something I often have trouble using up. I might crave it, but rarely for more than a stalk or two in one dish. What should happen to the rest? -a handful of wide, flat wheat or rice noodles. Sauté the onion, garlic, and ginger in the oil for 2 - 3 minutes. Add the celery, and stir well. After another five minutes, add the spices. Stir well, then add water. Bring to a boil. Add the noodles, and simmer until the noodles are tender (about 5 minutes for the type I use). Enjoy. You know I love enchiladas. I especially love THESE enchiladas. The pumpkin is sweet; the chipotle chilies are smoky... These are also a lovely color. Prepare the chipotle sauce as described above. Sauté the onion, garlic, and cumin until the onions are tender. Mix in with the pumpkin, mashing it to a reasonably smooth texture. Lay out the tortillas, and evenly divide the pumpkin and cheese between the tortillas, favoring one edge for ease of rolling. Roll the enchiladas-to-be up, and put them in a pan with half the sauce resting in the bottom. Cover with the remaining sauce when all are rolled. Cover the pan with foil, and bake for 40 minutes. For when you want something tasty and warming, but light enough not to spoil your appetite for whatever you have planned next. -two teaspoons of soy sauce, or to taste. Sauté the garlic, onion, and ginger root in hot oil for five minutes, or until the onion is soft. Add the water, and bring it to a boil. Add the powdered broth and rice stick (which usually cooks in two minutes) or your favorite rice noodle (which you should boil until it is thoroughly cooked). Reduce heat so that the soup simmers. When the noodles are just about done, add the remaining ingredients. Let them simmer for about a minute. Stir well and serve. This is a nice, light, foggy weather soup, good for tiding you over when you're on your way to a party in a foggy place where you know dinner will not be served on time. You'll be able to eat soon after, but you won't be famished, and you will have a mild inner warmth. Not that this ever happens to me. Polenta with pesto and black olives. Every time I eat polenta, I am stunned that it is not a constant part of my diet. Corn is such a satisfying veggie, and treated as if it were a dried grain like this, it is even more satisfying than cornbread. It is so versatile: it can be eaten soft shortly after cooking, cut into wedges once it has solidified, the slices can be baked in any range of delicious sauces, it can be deep fried to a golden-brown level of goodness... And it's less work to prepare than is commonly believed. -several tablespoons of olive oil. Instructions: bring the water or broth to a rolling boil. Pour in the polenta in a steady stream while whisking. When it returns to a boil, lower the heat to a simmer and whisk constantly and gently for about 10 minutes OR until you can leave patterns on the surface that persist (lumps that hold their shape). Allow the polenta to set until solid, about 1 hour. Sun-dried tomatoes have fabulous, intense, sweet flavor. Using both the sun-dried tomatoes and the olive oil they are packed in adds very intense tomato-goodness to polenta. -four ounces (114 grams) of olive-oil packed sun-dried tomatoes (minced or shredded) and accompanying olive oil. Instructions: bring the water to a rolling boil. Pour in the polenta in a steady stream while whisking. When it returns to a boil, lower the heat to a simmer and whisk constantly and gently for about 10 minutes OR until you can leave patterns on the surface that persist (lumps that hold their shape). You can eat this many ways: I recommend heating it in the microwave either as it is or smothered in your favorite tomato sauce. You can also cover it in fresh diced tomatoes; fresh diced tomatoes with shredded basil and garlic; and/or your choice of cheeses, such as provolone. Black olives also work well on top of this. If you add a very wet sauce (with or without cheese and olives on top), you can bake the polenta in the oven for about 45 minutes at 450 degrees, and it will absorb some of the sauce's flavor. This is a simpler variation of my Mediterranean lasagna, with a significantly shorter ingredient list. This is one of those rare, dairy-containing recipes: I haven't been very enthusiastic about dairy products in a while, but still have a special fondness for a type of goat cheese that is sold in my local market, which sinks in a big tub of salted water. -2 cups of fresh feta, rinsed if salty, and coarsely chopped/crumbled. Cook the lasagna noodles according to the maker's instructions, which usually means 3 minutes for fresh noodles or 9 - 12 minutes for dried. Drain, rinse in cold water, and toss with a little olive oil to keep these from sticking. Sauté the onions in a few tablespoons of olive oil; when they are soft, add the spinach. Turn the heat to low, and stir frequently. Cover for a few minutes to allow the spinach to wilt. Remove from heat. In a food processor, blend the tofu, garlic, olive oil, and oregano until it has the texture of a spiced ricotta. This should take less than a minute. 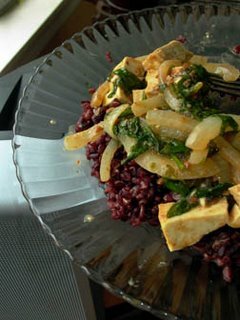 Put this tofu mixture into a large bowl. Add the sauté, the chopped olives, and the crumbled feta. Mix well. This is the filling. -the remainder of the sauce. Cover with tin foil, and bake 45 minutes to 1 hour.